Grab your cameras, phones and selfie sticks. The sunflower field at Whitehall Farm in Yellow Springs is in bloom! Every year, several acres of sunflowers burst into bloom in a field along U.S. 68, attracting hundreds of visitors who stop to take pictures. First, DO NOT PARK OR STOP ON U.S. 68! Doing so creates a hazard for those driving past the field. Instead, turn down the lane off of U.S. 68 and park in the open pasture to your right. Parking is free, so there is no excuse! Commercial activity, solicitations, and for-profit activities are NOT permitted. Please respect the privacy of the family, and stay within the sunflower field area. 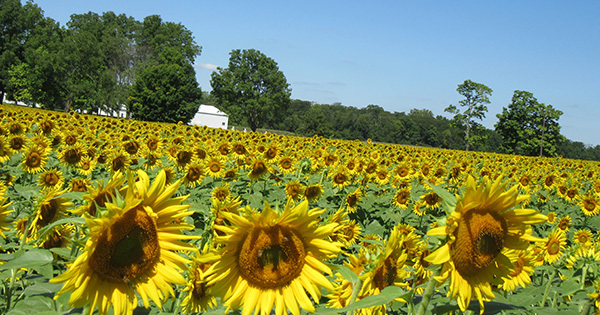 The sunflower field is located on US Rt 68 between the village of Yellow Springs and Youngs Jersey Dairy, across from Peifer Orchards. The flowers should bloom for about 2 weeks. For the best photos, visit on a sunny day in the first couple of hours after sunrise or before sunset. Above all, please be respectful when visiting. The sunflower field is private property, owned by a family who live on the farm and plant the sunflowers for all of us to enjoy. Thank you to Dave and Sharen Neuhardt and the Tecumseh Land Trust for this amazingly beautiful and generous gift to the community! Tecumseh Land Trust preserves open spaces, prime soils, and water resources in Clark and Greene Counties of Ohio for the benefit of future generations.